While I was in college I had a friend whose family owned a cabin on the southeastern shores of Lake Michigan. One evening we were visiting their cabin and parked along some cliffs that afforded an expansive view of the western horizon, the Great Lake, and the Chicago skyline in the distance. It was a gorgeous, calm evening but behind the skyscrapers of Chicago we saw black clouds rising. Over the next couple of hours we watched a massive midwestern thunderstorm develop before our eyes. 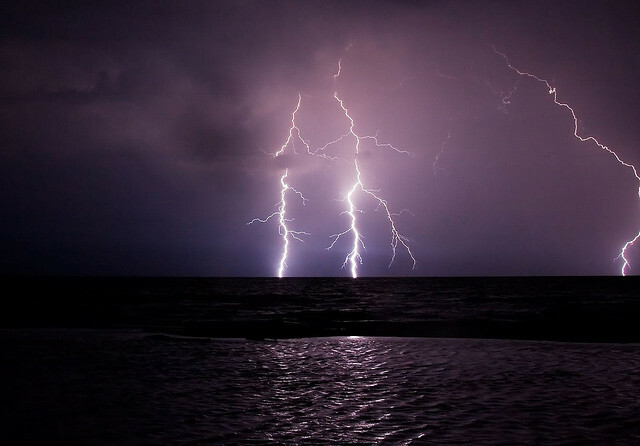 The dark clouds rose like mighty pillars and giant tentacles of lighting spread out like a breath-taking fireworks display across the evening sky. As the storm enveloped the city and began to cross the lake, the wind rose and giant white caps began to break against the shore beneath us. The thunder was deafening. God says that His eternal nature is evident in creation, in what He has made. That night looking out over Lake Michigan I remember thinking that we were witnessing a tour de force of God’s might. I’ve never forgotten that experience, and as I read the opening lines of Elihu’s conclusion in this morning’s chapter, my mind took me right back to that night. Elihu’s final words regarding the thunder of God’s voice foreshadows the final chapters of Job’s epic poem. After 37 chapters of silence in response to Job’s questions and the long debate with his friends, God is about to open His mouth to speak. As I write this post it is the morning of New Year’s Eve day. I look back on a strange and somewhat difficult year in 2014. I stand on the precipice of 2015 with more questions than answers. It’s perhaps apropos that the year had ended with a journey through Job’s epic poem, with questions, and with struggle. It is equally appropriate that the current year ends waiting to hear from the Almighty, and that the new year will begin with God’s voice. Whether God’s voice arrives in the thunder of a midwest storm or the whisper of a still, small voice, I’m anxious to hear what God has to say. I’m looking forward to what the new year will bring. We are a couple of weeks into rehearsal of Ham Buns and Potato Salad, which is a play I’ve written and re-written over the past five years. It will make its stage premiere April 10-13, 2014 in Pella, Iowa thanks to the hard work of Union Street Players. FYI: I do not have a part in the play. I am working with the director, Ann Wilkinson, and am enjoying the luxury of observing the process as writer and playwright. Most rehearsals I simply sit back and watch and document things with my camera. I’ve had to make some small changes to the script, and have chosen to make others. Ann consults with me once in a while on whether I think this or that choice will work. She and the actors are doing a great job, and I’m anxious to see the finished product. The contribution of others makes it stronger. Over the past five years Wendy and I have hosted a number of readings in our home with a number of different people. I’ve received a tremendous amount of feedback and have revised the script based on that feedback. I also had the privilege of taking the script to the Missouri Playwrights Workshop at the University of Missouri where I received incredibly valuable feedback from objective sources who understand the writing process much better than I do. What I’m discovering is that not only did the feedback allow me to make my script better, but all of the readings allowed friends and community members to feel a vested interest in the piece. They’ve had a hand in it. They feel a sense of ownership and responsibility that I find humbling. You can’t please everyone. Because I received a lot of feedback, I had to make very thoughtful and sometimes difficult decisions about which feedback I wanted to embrace and which I wanted to respectfully leave alone. In the end this is still my vision, my story, my characters, and my script. I have to be true to the voice inside of me and what I’m expressing. It will never be exactly what you envisioned in your head. I can picture the little town of Hebron. I see the houses, the yards, the porch, and the swing. I envisioned these characters. I heard their voices saying their lines in my head. Now that the show is in production, I’m finding that the set doesn’t look like I envisioned. The characters aren’t always saying the lines the way I heard them in my head. Sometimes the director and actors don’t get the things which I just intuitively know and understand about these characters and this story. Perhaps a movie script writer can storyboard, direct, shoot, manipulate, and edit the video to get exactly what they envisioned. The stage is a messier artistic playground. The bottom line is that I have to accept that I will never see on stage exactly what I envisioned in my head. There’s more there than you ever knew or intended. At the same time, I am finding that Ann and the actors are finding things in the script and characters that I never envisioned and that’s a good thing. I’m finding that there are layers to the story and the characters which I didn’t consciously write into the script. In the hands of capable artists the script takes on a life of its own. Things emerge. I’m blown away by it. You’ve got to let go. A professor of mine, and a playwright, always spoke of the process of writing in terms of birthing. You conceive an idea, it grows and is knit inside you, and then you give birth to it. The birthing process can be scary, painful, and messy. As with parenting, you’ve got to let go and let your baby become the person it was meant to be. Trying to cling and control will ultimately only serve to harm all parties involved. Ham Buns and Potato Salad will be produced by Pella, Iowa’s award winning community theatre, Union Street Players, and performed April 10-13, 2014 on the stage of the Joan Kuyper Farver Auditorium in the Pella Community Center, 712 Union St., Pella, IA. Tickets are $8 in advance for adults ($10 at the door) and $6 in advance for students ($8 at the door). Tickets are available on-line. Click here to order tickets online. 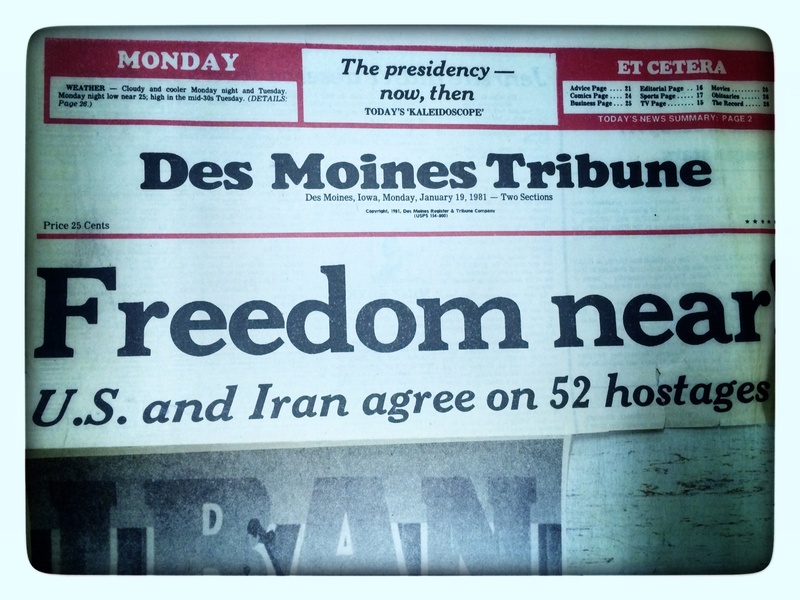 A Des Moines Tribune headline from the Iran Hostage Crisis in 1981 I still have in my archive. This morning as I went to the front door to gather the newspaper off the front porch, I was hit by a sudden wave of nostalgia. The simple joy of gathering the paper off the porch on a frigid January morning, and reading it over morning a hot cup of coffee is deeply rooted in my soul. I got my first job when I was almost twelve working as a paper boy for the now defunct Des Moines Tribune. There were two Des Moines newspapers when I was a kid. The Des Moines Register was the morning paper and the Des Moines Tribune was the afternoon paper. My buddy Scott Borg and I would categorize people in our neighborhood into “morning paper” people and “afternoon paper” people. Me and my family were afternoon paper people until the Des Moines Tribune closed up shop. As a paperboy for “The Trib” I picked up my bundle each afternoon after school at the corner of Madison and Lawnwoods Dr. With a big yellow canvas paper carrier that was slung over the shoulder and a bag of rubber bands (or plastic bags on rainy days), I would begin my trek each week day west up Madison Avenue to Lower Beaver Road, then south to Douglas Ave. 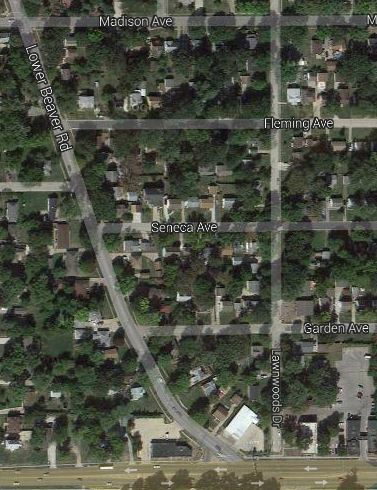 I would make my way back north on Lawnwoods Drive, as I zig-zagged up and down the side streets of Garden, Seneca, and Fleming Avenues. Delivering The Trib also meant you had to deliver the giant Des Moines Sunday Register early every Sunday morning. The slug who delivered The Register each weekday morning got to sleep in. Map of my old paper route. Every two weeks I was tasked with making a personal visit to each of my Tribune customers to collect their subscription fees. They would pay me and I would give them a little receipt torn from a perforated sheet of receipts. I would have to count the money, balance the amount, and turn it in to my regional manager. I got to know many of the people in the neighborhood around my home and even got a tip from time to time. I come from a family in which the protestant work ethic was firmly engrained. Work was a virtue to be pursued at an early age. From my early career in the newspaper business I became an “Inventory Specialist” for my dad’s sign company. The monotonous task of counting hundreds of screws, bolts and washers out of large bins taught me very quickly that I just might want to do something different with my life. Paperboy, bolt counter, corn pollinator, lawn maintenance, film duster, actor, babysitter, bus boy, and retail clerk. By the time I left high school and headed off to college I had a wealth of work experience. By the time I left college I could add librarian’s assistant, cook, dishwasher, resident assistant, waiter, caterer, and voice over talent to the list.